From the time the golfer hits off the first tee, in the shadow of the Sugarloaf Mountain, the Eddie Hackett designed 6,159 m pae-72, with a standard scratch of 72. Charlesland Golf Course presents a testing but eminently fair challenge. Visitors, Societies, Corporate Golf are assured of a warm welcome. The clubhouse incorporates a hotel with Full catering facilities and accommodation. Set in the shadow of the famous Wicklow Mountain's, Charlesland Golf and Country Club, designed by Irelands most celebrated and prolific course designer Eddie Hackett, designer of legendary links courses Waterville, Connemara, Murvagh and Enniscrone, has always been known as a challenging but fair test of golf, in a beautiful setting. The course at just less than 7,000 yards from the championship tees skirts the Irish Sea for the best part of the front nine with the home run being true parkland. 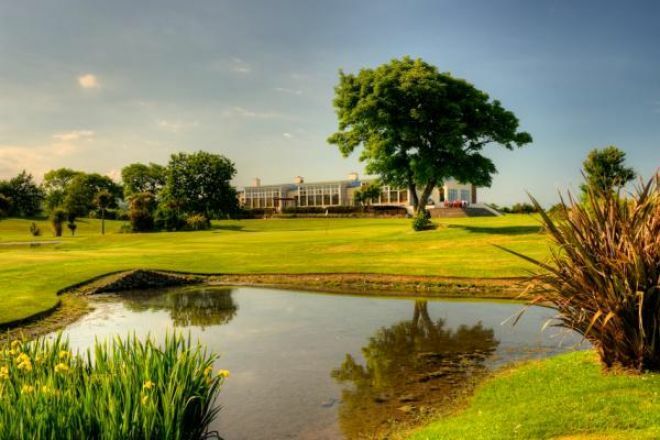 A superb award winning modern golf hotel further complements the course with 12 well appointed, spacious en-suite rooms. The conference and meeting facilities add to make this an ideal business venue. 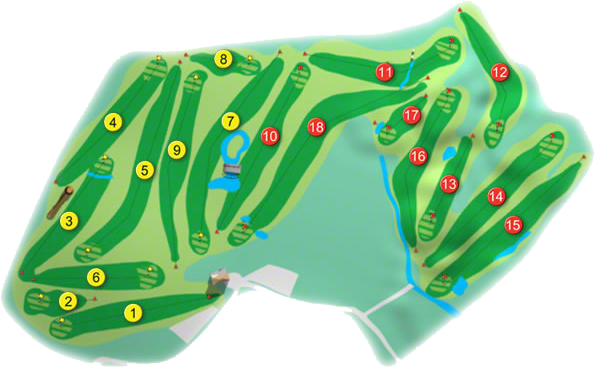 With a fully stocked modern pro-shop, range facilities, buggy, trolley and club hire the golfer could not ask for more. Charlesland Golf Club won the Fitzgibbon Cup in 2004 when the team was Jim Kiely, Gerry O'Riordan, Derek Dunne, John Shiel, Gavin Hunt, Ross Dunne, John Kestell, Eddie Ryan, Jim Quigley, David McCormick, Andy Clarkin, Alan Threadgold, Geoff Bell, They were captained by Malachy Venney, assisted by Dave Naughton. 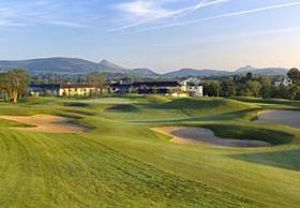 The Ladies of Charlesland Golf Club won the Finn Trophy in 2005 when the team was Hilary Gall, Patricia Metcalfe, Anne Benson, Michelle Dempsey, Patricia O'Regan, Carmel White, Maureen Dent, Fiona Scott, Trish Shiel, Hilary Murray, Emir Bruton, Ismay Flynn, Edwina Jennings, Geraldine Tennyson, Ita Grehan, Joan Griffin, Sheila Vaughan, they were captained by Eileen Woods. They won it prior to that in 2003 when the team was Attracta Mulligan, Geraldine Tennyson, Patricia O'Regan, Anne Benson, Anne Kilty, Hilary Gall, Ita Grehan, Trish Metcalfe, Edwina Jennings, Sheila Vaughan, Maureen Dent, Emir Bruton, Tish Barry, Joan Griffin, Trish Shiel, they were managed by Helen Pattison. Charlesland member Michael Ellott recorded a remarkable double early in 2002, when he chipped-in from from 100 yd´s for an eagle at the 9th. Amazingly he repeated it again from 80 yd´s at the 15th. Junior Captain in 2001 M. P. O'Brien spent May, June and July braking the course record on his home course. His final record came in the July Medal when he returned a 68 gross with six birdies on his card. One wonders is this 22-year-old finished. Charlesland won the Leinster Section of the Irish Junior Foursomes, sponsored by Jefferson Smurfit Group plc. They were beaten by Castletroy, the Champions, by one hole in the National Finals at Strandhill, on 21st August, 2000. Coached by Paul Heeney, the team was Patrick Boyle and Eoin Noonan, with Alan Fahey and Mark Flynn. Charlesland Under-16 won the Wicklow Youths' Championship in 2000 when the team was Darragh Flynn, Jamie Metcalfe, Stephen Rigley, Patrick Boyle, they were captained by Owen Metcalf and Paddy Boyle. Sheila McConnell (25), Lady Captain 2000 and her Ladies Captain's Prize winner Annette Fortune (20) qualified for the National Finals of the Volkswagen-Irish Independent Lady Captain's Classic at Druid's Glen when they shot 36pts. At a windy Headfort Golf Club in September, 2000. Michael Jackson (President) holed out on the 17th, 153 m, index 17, in his own President's Prize, as did Ciaran Earley, the following day at the same hole. Golf is not one of those occupationsin which you soon learn your level. There is no shape, nor size of body, noawkwardness nor ungainliness, which puts good golf beyond one's reach. Thereare good golfers with spectacles, with one eye, with one leg, even with one arm. None but the absolutely blind need despair. It is not the youthful tyro alone who has cause to hope. Beginners in middle age have become great, and,more wonderful still, after years of patient duffering, there may be a rift in the clouds. Some word, as a medal winner. In golf, whilst there is life there is hope".